The popularity of podcasts is growing in 2018, with podcast fans tuning in to episodes in droves for various reasons. Whether listening to podcasts to gain an education, learn new facts, find out about current events, or to spur their creative processes forward, podcast fans are discovering that they have new options when it comes to the “unbundled” podcast. Podcasts have become one of the most recent products and services to experience the phenomenon of unbundling. However, as the amount of podcast listeners grows tremendously, plenty of those users may not even know what “unbundling” means. To “unbundle” a product or service is defined as offering separate options instead of merely a larger and more expensive package. The unbundling trend is revamping not strictly podcasts — but everything from entertainment and healthcare services to higher education and beyond, which has begun offering consumers better options. As noted by Stratechery, prior to the advent of the Internet, traditional print newspapers and magazines married advertising and editorial content into the same publications and distributed the words in an expensive manner, using pricey printing machines, ink and paper. However, the Internet has enabled not only the replacement of printers with web servers, but it has also separated monetization and content creation through the unbundling process. For example, Facebook owns their users’ attention and ads, but Facebook does not create content. In contrast, newspapers create their content and run advertisements as a bundle. Other models of unbundling include the emergence of companies like Netflix, which gathers income directly from the consumer in monthly increments for “unbundled” services and viewable content that brings consumers away from pricier bundled packages. The benefits of unbundling over the years have included full CD music albums that have been transformed via iTunes and Spotify to individual song choice offerings — a move that lets people buy only the songs they like. Unbundling has helped users replace expensive network and cable TV packages like DirecTV with Netflix in droves, according to Fortune. Certain stacks of episodes are released all at once on Netflix and Hulu instead of waiting for weekly TV releases of episodes on a schedule. Financial apps like Venmo are unbundling banking services from traditional banks, while Khan Academy and Coursera let students learn what they desire via single courses or learning sessions instead of requiring full bundled degrees. It’s a revolution in unbundled learning. YouTube offers a similar option with their “watch later” option, which means YouTube users don’t have to subscribe to specific channels and can just watch chosen individual videos from different channels. Likewise, the Listen Later tool provided by Listen Notes is just like “read later” for articles or “watch later” for videos, but works for podcast episodes. Listen Later helps the unbundling movement of podcasts. For example, a podcast listener could search for episodes by topics or proper names (e.g., Elon Musk) or take a scroll through the list of the hottest podcasts and cherry-pick the episodes that they would like to add via Listen Later. Then during an opportune time, the podcast user can soak up their specific playlist using Listen Later in the most efficient manner, similar to the way that music listeners choose special playlists from Spotify for their workout sessions, studying periods, etc. The unbundled podcast episode listening option assists listeners by allowing them to listen and learn from only those episodes that strike their fancy — a much less time-consuming procedure than days gone by, when cassette tapes or vinyl albums made cherry-picking certain songs a laborious pursuit. If a person is interested to learn about Tony Robbins, they might find Robbins being interviewed on Oprah’s “Super Soul Conversations by Oprah” podcast series, but they aren’t interested in other interviews therein. The magic of unbundling means that they don’t have to subscribe to Oprah’s entire podcast, but just listen to Robbins speaking about the secret to getting ahead, or how to overcome failure. As podcasts grow more popular, so will the desire for various ways to consume podcast episodes. The fact that there are tens of millions of podcast episodes in existence thus far has already created the need for an effective and powerful podcast search engine like Listen Notes. Podcasts are being praised as the next best storytelling and advertising platforms. Therefore, with the major growth in podcasting being predicted by a number of indicators, expect the unbundling of podcasts to represent only one area where the separation of products and services into more attractive bundles appears in the future. The possibilities of unbundling everything from podcasts to exercise locales to eateries are limitless, as are the trends seen in podcast offerings, such as daily podcasts. As reported by Pacific Content, trends in podcast listening include weekly podcast listeners jumping from five to seven podcasts heard per week. Such a huge change in 2018 podcasting trends is showing that the hunger for podcasts is only growing stronger — therefore, expect the unbundling of podcast episodes to become only the latest technological offering to satisfy consumers’ desires. More and more podcasts are being produced and it is unrealistic to subscribe to tons of podcasts, leaving most of the episodes unplayed. 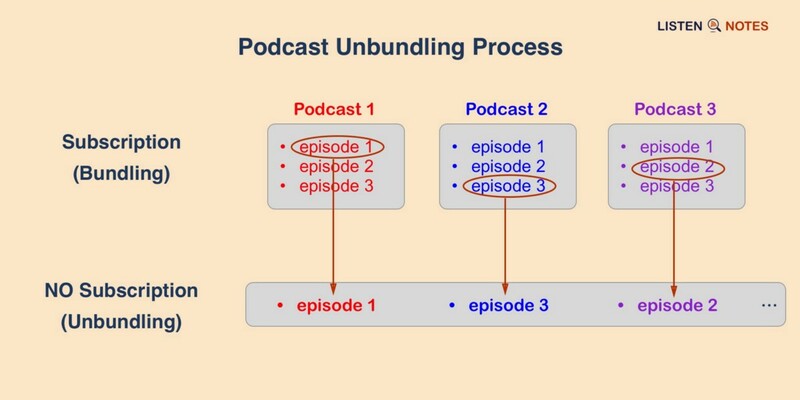 Unbundling podcasts solves this problem well, helping people become episode centric instead of podcast centric.